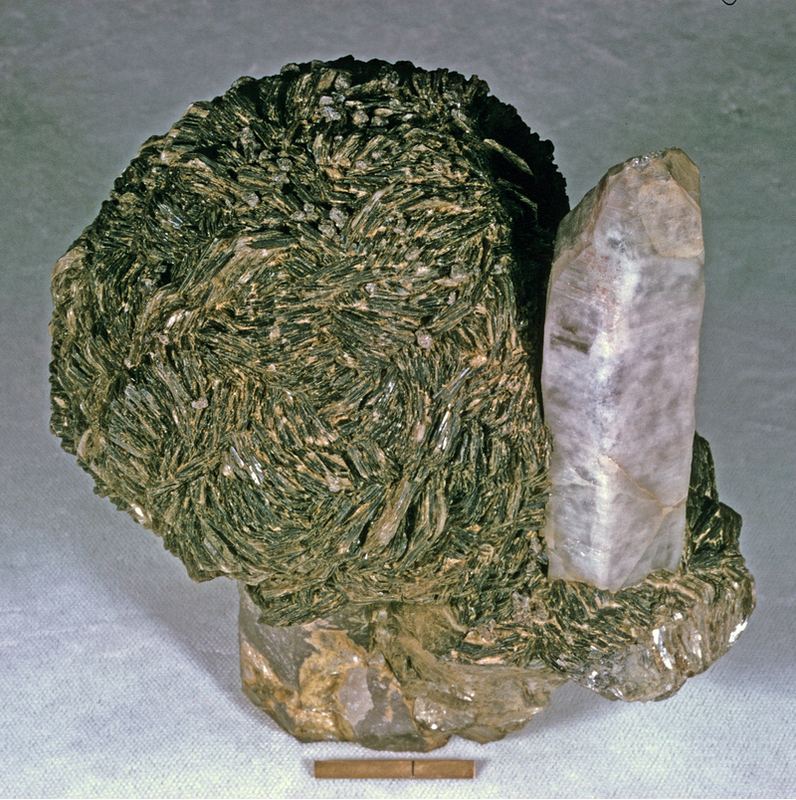 Zinnwaldite: Mineral information, data and localities. Named after its discovery locality at Zinnwald, on the border between Germany and the Czech Republic. Zinnwald was named for its tin deposits. No longer a species - a series of trioctahedral micas on, or close to, the siderophyllite-polylithionite join; dark micas containing lithium (Rieder et al., 1998). -1M, -2M, and -3T polytypes are known. 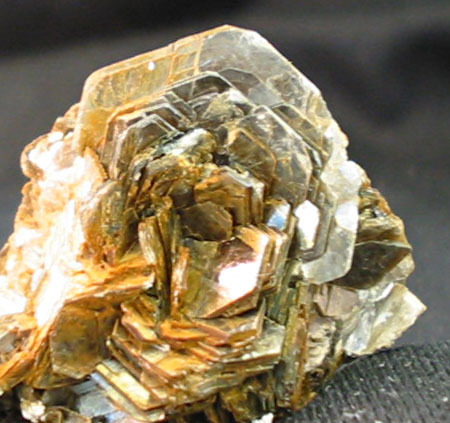 The original zinnwaldite material came from Cínovec / Zinnwald (Cinvald), Erzgebirge; Krusné Hory Mts, Saxony & Ústí Region (Bohemia; Böhmen; Boehmen), Germany & Czech Republic. Quartz 54 photos of Zinnwaldite associated with Quartz on mindat.org. Albite 29 photos of Zinnwaldite associated with Albite on mindat.org. Smoky Quartz 23 photos of Zinnwaldite associated with Smoky Quartz on mindat.org. Orthoclase 21 photos of Zinnwaldite associated with Orthoclase on mindat.org. Fluorite 21 photos of Zinnwaldite associated with Fluorite on mindat.org. Spessartine 9 photos of Zinnwaldite associated with Spessartine on mindat.org. Pyknite 9 photos of Zinnwaldite associated with Pyknite on mindat.org. Microcline 8 photos of Zinnwaldite associated with Microcline on mindat.org. Cassiterite 8 photos of Zinnwaldite associated with Cassiterite on mindat.org. Scheelite 8 photos of Zinnwaldite associated with Scheelite on mindat.org. Haidinger, W. (1845), Handbuch der bestimmenden Mineralogie (Vienna): 521. European Journal of Mineralogy (1996): 8: 1241. Rieder, M. et al. (1998): Nomenclature of the Micas. The Canadian Mineralogist 36, 905-912. The following Zinnwaldite specimens are currently listed for sale on minfind.com. Bouabsa, L., Marignac, C., Chabbi, R., & Cuney, M. (2010). The Filfila (NE Algeria) topaz-bearing granites and their rare metal minerals: Petrologic and metallogenic implications. Journal of African Earth Sciences, 56(2), 107-113.
ⓘ Vil Achay mine ? Calderwood, M.A., Grguric, B.A., Jacobson, M.I. (2007) Guidebook to the Pegmatites of Western Australia. Hesperian Press, Carlisle, Western Australia, 394 pages. Report of the Department of Mines for the State of Western Australia for the Year 1942, pp 84-85. 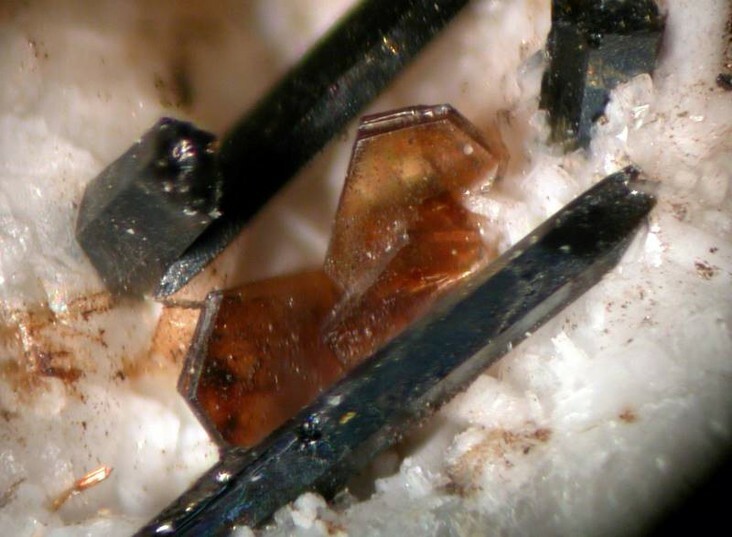 J. Quéméneur & M. Lagache (1994): LA HOLMQUISTITE DES PEGMATITES DE VOLTA GRANDE PRES DE SÃO JOÃO DEL REI, MINAS GERAIS, BRESIL: CARACTERISTIQUES CHIMIQUES ET MINERALOGIQUES. GEONOMOS, 2 (2), 15-21. [http://www.igc.ufmg.br/geonomos/PDFs/2_2_15_21_Quemeneur.pdf]; Quéméneur, J., & Lagache, M. (1999). Comparative study of two pegmatitic fields from Minas Gerais, Brazil, using rubidium and cesium content of the micas and feldspars. Brazilian Journal of Geology, 29(1), 27-32. GSC Economic Geology Series, No. 11, 1932. Walker, T.L. and Parsons, A.L. (1924) "Pegmatite Minerals from New Ross, Nova Scotia", University of Toronto, Geol. Series, no. 17, pp. 46-50.
ⓘ James pegmatite (Ballpeen) ? Winchell, A. N., 1942, Futher Studies of the Lepidolite System, American Mineralogist, v. 27, p. 114-130. Jinchu Zhu, Renke Li, Fuchun Li, Xiaolin Xiong, Fengying Zhou, and Xiaolong Huang (2001): Mineralium Deposita 36(5), 393-405. Xiangli Chen, Yanhui Jin, and Ciguo Xie (2003): Acta Mineralogica Sinica 23(4), 323-326. Belkasmi, M., Cuney, M., Pollard, P.J., and Bastoul, A. (2000): Mineralogical Magazine 64(3), 507-523. Bull. Minéral. , 1988, 111, pp. 477-492. Breiter, K., et al (December 1997), The Jour. of Petrology: 38(12). Staněk, J.: Příspěvky k mineralogii některých západomoravských pegmatitů. Časopis Moravského musea v Brně, 1952, roč. 37, s. 112-125. Nemec, D. (1982): A pegmatite with lithium mineralization at Radonin, western Moravia. Chemie der Erde 41, 241-253 (in German). Mourey Y. (1985): Le leucogranite à topaze de Chavence. Un nouvel exemple de massif à Sn, W, Li dans le Nord du Massif central français. C. R. Acad. Sci., Paris, t. 300, série II, n° 19, 951-954. Palache, C., Berman, H., & Frondel, C. (1951), The System of Mineralogy of James Dwight Dana and Edward Salisbury Dana, Yale University 1837-1892, Volume II: 938; Wittern: "Mineralfundorte in Deutschland", 2001. Pezzotta F., Diella V., Guastoni A. (2005): Scandium silicates from the Baveno and Cuasso al Monte NYF-granites, Southern Alps (Italy): Mineralogy and genetic inferences. Am. Mineral., 90, 1442-1452. American Mineralogist (2005) 1442-1452.; Maulini A. (†), (edited by) Albertini C. & Pezzotta F. (2016): Cave di granito di Agrano, Omegna (Verbano-Cusio-Ossola). Storia di un ritrovamento del febbraio 1993. Riv. Mineral. Ital., 40, 1 (1-2016), 40-47. Gallitelli P. (1938): Ricerche petrografiche sul Montorfano (Lago Maggiore). Mem. R. Acc. Sci. Lett. Arti Modena, 3, 1-92; Scaini G. (1939): Itinerari mineralogici. Comune di Mergozzo. Località: cave di granito bianco di Mont’Orfano. Natura, 30, 3, 155-159; Del Caldo A., Moro C., Gramaccioli C.M., Boscardin M. (1973): Guida ai minerali. Fratelli Fabbri Editori, Milano, 208 pp. ; De Michele V. (1974): Guida mineralogica d'Italia. Istituto Geografico De Agostini, Novara, 2 vol., 408 pp. ; Gramaccioli C.M. (1975): Minerali alpini e prealpini. Istituto Italiano Edizioni Atlas, Bergamo, 2 vol., 472 pp. Masutomi Museum specimens (Kyoto); Brigatti, M. F., Mottana, A., Malferrari, D., & Cibin, G. (2007). Crystal structure and chemical composition of Li-, Fe-, and Mn-rich micas. American Mineralogist, 92(8-9), 1395-1400.; Sueno, S., Matsuura, S., Bunno, M., & Kurosawa, M. (2002). Occurrence and crystal chemical features of protoferro-anthophyllite and protomangano-ferro-anthophyllite from Cheyenne Canyon and Cheyenne Mountain, USA and Hirukawa-mura, Suisho-yama, and Yokone-yama, Japan. Journal of mineralogical and petrological sciences, 97(4), 127-136. Neiva, A. M., & Neiva, J. (2005). Beryl from the granitic pegmatite at Namivo, Alto Ligonha, Mozambique. Neues Jahrbuch für Mineralogie-Abhandlungen: Journal of Mineralogy and Geochemistry, 181(2), 173-182. Wartha, R., Palfi, A., Niedermayr, G., Brandstätter, F. and Petersen, O. V. (2006): Der Aris-Phonolith-Komplex und seine Mineralien. In: Jahn, S., Medenbach, O., Niedermayr, G. & Schneider, G., Eds. (2006): Namibia – Zauberwelt edler Steine und Kristalle. 2nd ed., Bode-Verlag, Haltern, Germany, pp. 228-239 (in German). Imeokparia, E. G. (1983). Lithogeochemical dispersion associated with Ririwai zinc-tin lode, Northern Nigeria. Journal of Geochemical Exploration, 19(1-3), 643-661. Mineralogical Record 28, No. 4 (1997); collections of Rock Currier, Jack Crowley, Jaroslav Hyrsl and Alfredo Petrov. João Farinha Ramos (2007) Locality no. 5: Seixo Amarelo-Gonçalo Rare Element Aplite-Pegmatite Field. in ALEXANDRE LIMA & ENCARNACIÓN RODA ROBLES ed (2007) GRANITIC PEGMATITES: THE STATE OF THE ART - FIELD TRIP GUIDEBOOK. MEMÓRIAS N. º 9, UNIV. DO PORTO, FACULDADE DE CIÊNCIAS, DEPARTAMENTO DE GEOLOGIA pp 73-86.; Neiva, A. M. R., Silva, M. M. V. G., Antunes, I. M. H. R., & Ramos, J. M. F. (2000). Phosphate minerals of some granitic rocks associated quartz veins from northern and central Portugal. João Farinha Ramos (2007) Locality no. 5: Seixo Amarelo-Gonçalo Rare Element Aplite-Pegmatite Field. in ALEXANDRE LIMA & ENCARNACIÓN RODA ROBLES ed (2007) GRANITIC PEGMATITES: THE STATE OF THE ART - FIELD TRIP GUIDEBOOK. MEMÓRIAS N. º 9, UNIV. DO PORTO, FACULDADE DE CIÊNCIAS, DEPARTAMENTO DE GEOLOGIA pp 73-86. Rodionov, S.M., Schnaider, A.A., Romanovsky, N.P., and Gurovich, V.G. (2007): Geology of Ore Deposits 49(4), 285-296.; Gonevchuk, V. G., Korostelev, P. G., & Semenyak, B. I. (2005). Genesis of the Tigrinoe tin deposit (Russia). Geology Of Ore Deposits C/C Of Geologiia Rudnykh Mestorozhdenii, 47(3), 223.; Shunso Ishihara, Valeri G. Gonevchuk, Galina A. Gonevchuk, Pavel G. Korostelev, Grigori R. Saydayn, Boris I. Semenjak And Vladimir V. Ratkin (1997) Mineralization Age of Granitoid-Related Ore Deposits in the Southern, Russian Far East. Resource Geology, 47(5), 255-261.; Terleev, A. A., Simonov, V. A., Kanygin, A. V., Tokarev, D. A., Stupakov, S. I., & Kotlyarov, A. V. (2014). Unique location of hydrothermal biota in the Lower Cambrian sedimentary-volcanogenic complex of the Kyzyl–Tashtyg ore field (Eastern Tuva). Russian Geology and Geophysics, 55(1), 54-61. Pavel M. Kartashov data; Sokol, E. V., Seryotkin, Y. V., & Bul’bak, T. A. (2010). Na-Li-Be-rich cordierite from the Murzinka pegmatite field, Middle Urals, Russia. European Journal of Mineralogy, 22(4), 565-575. Bulnaev, K.B. (2006): Geology of Ore Deposits 48(4), 277-289.
http://www.minsocam.org/MSA/Special/Pig/PIG_articles/Zaraisky.html (Previously published in: Mineral Deposits: Research and Exploration Where do They Meet? Proceedings of the Fourth Biennial SGA Meeting , Turku/Finland/11-13 August 1997) and F.G. Reyf et al. , The Canadian Mineralogist, 2000, Volume 38, number 4, Pages 915-936. Harada, J. and Ishikawa, T. (1944) Report of the 58th minor committee for special minerals and ores, Japan Science Promotion Association, no. 5. Williamson, B.J., Stanley, C.J., and Wilkinson, J.J. (1997): Contributions to Mineralogy and Petrology 127, 119-128.; Barstow, R. W. (1982). Variscite from Hensbarrow china clay works, St. Austell, Cornwall. Mineralogical magazine, 46, 512. UK Journal of Mines and Minerals, No. 14 p27; Barstow, R. W. (1982). Variscite from Hensbarrow china clay works, St. Austell, Cornwall. Mineralogical magazine, 46, 512. Hall, A. and Walsh, J.N. (1972) Zinnwaldite granite from Glen Gairn, Aberdeenshire. Scottish Journal of Geology, 8, 265-267. Esipchuk K. (2001) Mineralogy, geochemistry and origin of the Korosten gabbro-anorthosite-rapakivi granite pluton (Ukraine) in Abstracts – GEODE field workshop 8-12th July 2001 on ilmenite deposits in the Rogaland anorthosite province, S. Norway. Dumańska-Słowik, M., Wesełucha-Birczyńska, A., & Natkaniec-Nowak, L. (2013). Inclusions in topaz from miarolitic pegmatites of the Volodarsk-Volynski Massif (Ukraine)–A Raman spectroscopic study. Spectrochimica Acta Part A: Molecular and Biomolecular Spectroscopy, 109, 97-104. Anthony, J.W., et al (1995), Mineralogy of Arizona, 3rd.ed. : 430; Jahns, Richard H. (1952), AZ Bur. of Mines Bull. 162. Anthony, J.W., et al (1995), Mineralogy of Arizona, 3rd. ed. : 430; Wilson, E.D. & G.H. Roseveare (1949), Arizona nonmetallics: a summary of past production and present operations (2nd. ed. ), AZ Bur. Mines Bull. 155; Galbraith, F.W. & D.J. Brennan (1959), Minerals of AZ: 105. Pemberton, H. Earl (1983), Minerals of California; Van Nostrand Reinholt Press: 430. Weber, F. H. 1963. Geology and mineral resources of San Diego County, California. California Division of Mines and Geology, County Report 3: pages 89-91; illus., maps. Jahns, R. A., and Wright, L. A. (1951), Gem and Lithium-Bearing Pegmatites of the Pala District, San Diego County, California. California Division of Mines and Geology Special Report 7A: 31, 40.
ⓘ Pulsifer Quarry & Dionne extension ? ⓘ Kensington Mica Mine (Gilmore Mine; B. H. Warner Mine) ? Ref. : Minerals in the Washington D.C. Area. Gems & Minerals 395 (August, 1970). ⓘ Custer Mountain lode (Snookum mine) ? Ackermann, A. J. L., KJ, B., & KC, H. (1966). The geology of some beryl pegmatites in Southern Rhodesia. South African Journal of Geology, 69(01), 1-38.
http://geology.csupomona.edu/drjessey/class/GSC433/Pegmatites.htm; Cerny, P., Anderson, A. J., Tomascak, P. B., & Chapman, R. (2003). Geochemical and morphological features of beryl from the Bikita granitic pegmatite, Zimbabwe. The Canadian Mineralogist, 41(4), 1003-1011.